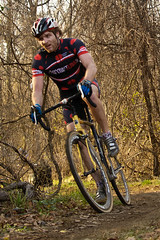 Adam Driscoll and Patrick Blair (Adventures for the Cure) usually get interviewed on this site because they are fast guys finishing at the top of their fields each week of the ‘cross season.Blair is always battling for the top step in the 3/4 race and sometimes jumps in to the elite race for a little more pain. Driscoll, in his first year in the elites, is a mainstay on the podium, nipping at the heels of the top three finishers every race. 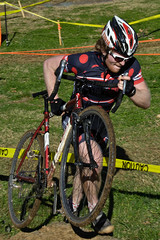 Driscoll will be the first to tell you he is still learning the CX game. He hasn’t been racing that many years and was handing it to the cat fours only two years ago. The first time I remember seeing Adam was in 2007 at the Ed Sander Memorial race. He was leading the C race when he had a mechanical with about a quarter lap to go. Second place was charging hard but Driscoll didn’t panic. He picked up his bike and got his sprint on. I think he ran that finishing stretch, shouldering the bike, faster than most could ride it. He held off second and took the win. He then fixed the bike, lined-up, and podiumed in the B race. So how did the trip go? Luck has it that you can find out for yourself. “Adventures For The Cure: The Doc” will be screened tonight, December 3, at Bicycle Stations (2204 14th st NW). Show starts at 7pm with a screening of a short documentary on the 2009 Lost River Classic. Don’t show up late, word has it the shop can seat around thirty folks. Although not officially part of the Bicycle Film Festival, the AFC movie is a nice kick-off for a weekend of all things celluloid and bike. For more information on the festival, check back here tomorrow and also go here: bicyclefilmfestival.com. If you can’t make it to the screening, the AFC documentary is available for purchase at www.adventuresforthecuremovie.com. Recently, I chatted with Adam and Pat about the movie and life on the road with your single-speed bicycle. Here’s what they had to say. In fifty words or less (and, yes, I’m counting) tell us what the movie is about. What was it like the first time you got back on a bike that coasted? Blair: Pleasantly surprising. To pedal for a bit and then realize that you don’t ‘have to’ pedal when you go down a hill or when you are riding over a bump in the road is kinda nice. Driscoll: Well I normally train on a fixed gear bike so I cant really remember what it was like. I love my Surly Steamroller! What is the most memorable moment of the trip? It doesn’t have to be the most meaningful, just the thing that sticks out in your mind as drop-dead funny, amazing, scary, etc. And “All the wonderful people we met” is not an acceptable answer. Blair: The Rockies are absolutely breathtakingly beautiful! If you have not been to the west coast you gotta get out there and check them out. Driscoll: Scariest moment would definitely be when my insulin pump broke and I did not have any syringes to give myself insulin. Most memorable moment was the ride up Mt Vesuvius, VA. It was this huge steep hill in VA that all three of us raced up. What’s one thing you learned about Adam/Pat during your adventure that may surprise people? Blair: Adam loves biking. [laughs] Maybe you already know that! But when you bike every day for three months straight and it is over 100 degrees half the time and you still LOVE biking then you really truly LOVE biking. In the end Jesse and I could not wait to be done. I hated biking at that point. Adam… I think he would have biked all the way back to the west coast if he could have. Driscoll: Pat starting to fall in love with his future wife (Lauren) as we were biking across. One time near end of trip Jesse and I were biking and all of sudden one day Pat started biking much faster and we figured out it was because Lauren was coming to visit that day and he wanted to get to the finish city earlier to see her. Jesse and I did not want to bike fast. We made a big joke that he had heart bubbles all around him when he was chatting with her on the computer at the end of the day and when she would visit. Blair: You will have to ask the producer/director/editor/videographer PHillyK. We wanted him to make a film of our Race Across America adventures both this year and last year. Those would make for great movies! There is a lot of drama that happens in a seven day bike race across the country. Driscoll: That would be cool if there was a sequel but that is up to the producer PHillyK. He is super artsy and I believe once you do it once you don’t like to do same thing twice so not sure. What was your standard breakfast during the trip? Blair: Maybe not my ‘standard breakfast’ but my most sought after breakfast was blueberry pancakes with peanut butter and syrup. In the beginning of the trip someone made us blueberry pancakes for breakfast and it was so awesome that I blogged about it. Later when we stayed with people, they had read the blog and made us pancakes because they knew I was obsessed with them. I don’t eat many pancakes now, but when biking 100mi per day every day for three months you need the extra calories! Driscoll: That depended on where we were! If we were staying with a nice family they usually knew what we liked because of our blog and would make us huge blueberry pancake breakfasts! Other times when we were sleeping on picnic tables in Kansas it was just a powerbar and water. Where can I buy a lot of helium filled heart bubble balloons….and is there a way to tie them to Pat’s pit bike?